Several hours after the Israel Defense Forces assassinated Popular Resistance Committees chief Jamal Abu Samhadana, the Palestinians were quick to respond. Two Qassam rockets were fired from the northern Gaza Strip toward the southern town of Sderot. One rocket landed in an apartment building's yard, while the other two fell in an open areas. There were no reports of injuries. The defense establishment currently holds 80 terror warnings, 11 of them concrete. Most of the warnings came from the northern West Bank. Who are you, Jamal Abu Samhadana? At around 5 a.m., Sderot's Red Dawn alert system was activated. Shortly afterwards, loud explosions were heard across the city. An inquiry revealed that two Qassam rockets had been launched from the northern Gaza Strip toward the town. One rocket landed in an apartment building yard, shattering the building's windows. One of the building's tenants told Ynet: "We heard the loud explosion in the early hours of the morning and rushed outside. Despite the early hour, there were quite a few terrified people who went outside. There was a pit in the ground, windowpanes were shattered, and several chairs in the area were damaged." "Police and Magen David Adom forces arrived within a number of minutes. Luckily, this time it only hit the yard, but a few more meters and it would have resulted in disaster," the resident said. Another rocket fell in an open area and did not cause any damage. There were no reports of injuries. At around 11 a.m., the Red Dawn alert system was activated again after detecting the launching of a rocket from the northern Strip toward Sderot. Police estimated that the rocket landed in an open area north of the town without causing any injuries. 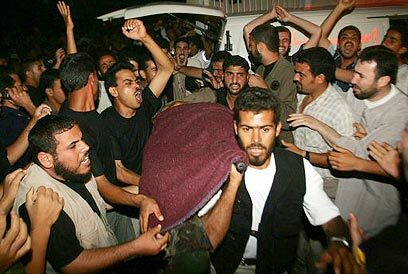 The rockets were fired at Israel several hours after the Israel Defense Forces' Southern Command and the Israel Air Force assassinated Abu Samhadana, who was considered one of the senior wanted Palestinians. The strike took place Thursday at around 11:30 p.m. An IAF aircraft attacked a training camp of the Salah al-Din Brigades, the military wing of the Popular Resistance Committee, in the Rafah area. The missiles were fired at a post housing several gunmen belonging to the organization, which has recently been leading rocket attacks against Israel. Immediately after the assassination, Popular Resistance Committees members threatened revenge against Israel. "With the help of Allah we will avenge the killing of Abu Samhadana, and not through declarations, but by firing rockets at Israel and sacrificing our lives. Suicide combers will detonate themselves everywhere," an organization official said. Abu Samhadana was recently appointed as the Palestinian Authority's Interior Ministry's general supervisor. His organization took part in the recent intifada by launching large terror attacks against the IDF and settlers in the Gaza Strip. The organizations terrorists were responsible for killing soldiers in a tank explosion and in a military armored personnel carrier. The organization also took part in tunnel attacks. Israel and the United States consider the organization's members as the main suspects in the killing of the American security guard guild in an explosion near their convoy at the Erez Crossing area. See all talkbacks "3 Qassams hit south following IAF killing"